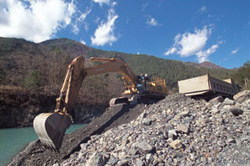 The ZX850H, fitted with an extra large bucket, is used to collect sediment in the Amehata dam in Yamanashi, Japan. The machine has worked hard for eight to nine hours per day, since September 2003. Sediment dredging project started 28 years ago, and now produces 400,000 m3 (800,000 tons)/year of gravel (hard sandstone), rocks, and sand at a plant near the dam. This production is equivalent to the total payload of 200 dump trucks per day. The products are high-quality aggregates. This dam was constructed and owned by Nippon Light Metal Co., Ltd. to delivery the electric power to its own factory. Like other dams, sediment is a serious problem in the Amehata dam. Today, sediment occupies about 95% of the total dam capacity. The haulage road is easily eroded by heavy rain. To maintain the road, the ZX370MTH are working together with the ZX850H. The ZX370MTH is a purpose built machine that combines the ZX400 undercarriage and ZX330 upperstructure. To maintain the intake of dam, an important section for electric power generation, sediment must be dredged up. This dredging cost is required to be offset by sales of rocks, sand and gravel produced. To fully load a dump truck, the preceding EX800H requires two and half passes of the bucket (that is, three passes). By contrast, the current ZX850H requires only two passes, and is almost trouble free. The ZX850H is working at the forefront, and the EX800H is on standby. Gravel, collected by the ZX850H, is loaded onto dump trucks, and transferred to the belt conveyer located at 1000 m away. This conveyer extends 1200 mm through tunnel, and discharges gravel into a hopper at its end. This plant is one-man controlled. The products are classified into stones of 2000 tons, sand of 1500 tons, and gravel of 500 tons. The ZX850H on sediment for dredging. The ZX850H collects gravel, increasing job efficiency. Output of plant is 5000 tons/day. Self power generation system is under study to save electric power costs. We plan to dredge at the center of dam in the future. The dredged materials may be siltation. The study of how to dredge and how to get benefits is under way. Sediment dredging is the key to saving dams. This is a common, nationwide problem in dams, and needs a solution. We endeavor to enhance labor-saving operation, including unmanned control. At sediment collection site, the use of only one large-sized machine is ideal. The ZX850H plays this role under tough job conditions without failure, backed by reliable Hitachi maintenance system. Walom Construction Supply Co., Ltd.